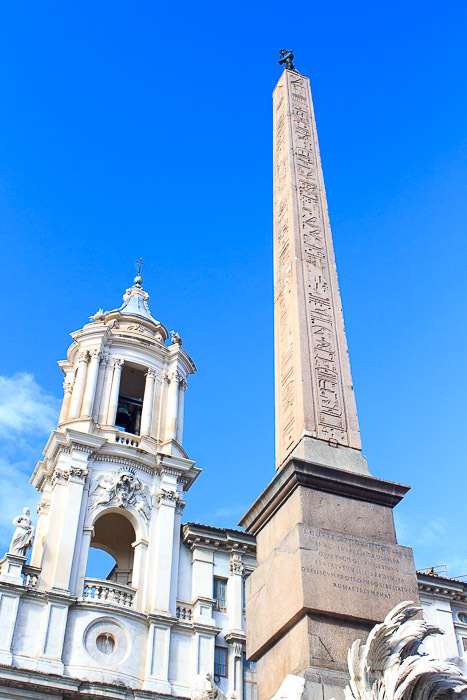 The Agonal Obelisk is 54.2 feet tall (about 100 feet with base), covered in hieroglyphics, and dominates Piazza Navona in modern Rome, standing at the center, above Bernini's Fountain of the Four Rivers. The obelisk was a copy of an Egyptian obelisk commissioned by Domitian and transported to Rome where the hieroglyphics were cut. They allude to the repair of the Temples to the Egyptian gods Isis and Serapis, located near today's Santa Maria sopra Minerva, which had been ruined in the fire of 80 AD, and they also include the names of Vespasian, Titus and Domitian, correctly carved using hieroglyphics. The obelisk was erected at that time at the Temple of Serapis. When the Circus of Maxentius was built in 309 AD on the via Appia, Maxentius moved the obelisk to the spina of that circus. The obelisk fell in the 6th century and it broke into five pieces. The Earl of Arundel paid a deposit and attempted to ship four of the pieces to London in the late 1630s but Urban VIII disallowed its export. 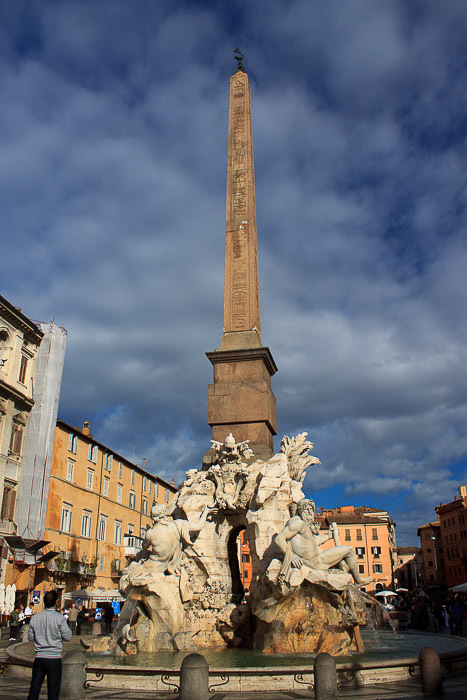 In 1648 the obelisk was repaired and in 1649 it was erected on top of the Fountain of the Four Rivers designed by Gian Lorenzo Bernini to celebrate the glory of Pope Innocent X, in Piazza Navona, where it still stands. Bernini had not been invited to submit a project for the fountain because the Pope reproached him for his too-close connection with his predecessor Pope Urban VIII and for the technical failure of his attempt to erect bell towers for St Peter's Basilica. Bernini found a way to have a model of the fountain seen by the Pope and he immediately was given the commission. The base of the obelisk is cut through in both directions, creating the illusion that the obelisk is unsupported. The top of the obelisk is decorated with the dove of Innocent X. The obelisk is named the Agonal Obelisk because Piazza Navona was originally a stadium named Circus Agonalis built by emperor Domitian in 96 AD. See all Agonal Obelisk photos.